DEMILEC APX� is a revolutionary new open cell spray foam that can be sprayed in attics and crawl spaces without an ignition barrier or coating. DEMILEC APX provides all of the traditional benefits you expect from spray foam including air sealing, helping reduce dust and allergens and contributing to a healthier living environment. 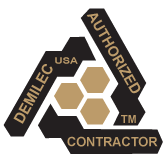 Click here for DEMILEC APX technical documents. SEALECTION� 500 is an open cell spray foam insulation that expands to fill all cracks, gaps and voids to provide an insulation and air barrier in one application. SEALECTION 500 has improved energy efficiency for millions of homes over the past 20 years. It will not sag, settle, deteriorate or decompose, so future generations can count on SEALECTION 500 to deliver the same performance as the day it is installed. SEALECTION 500 is a great choice for today�s energy conscious homeowner. Click here for SEALECTION 500 technical documents. SEALECTION Agribalance� combines natural, renewable oils with our traditional high performing spray foam insulation to provide one of the highest R-value�s for open cell foam in the industry. By reducing air leakage from your home, SEALECTION Agribalance decreases dust and air pollutants, minimizes noise and maximizes energy efficiency. HEATLOK SOY� 200 PLUS has a unique formula that incorporates renewable oils and recycled plastic bottles in the creation of a high performing, closed cell insulation. A single application provides air, water and vapor protection and improves your home�s structural integrity. By providing multiple benefits in a single application, HEATLOK SOY 200 PLUS may be the most versatile choice for your home. Click here for HEATLOK SOY 200 PLUS technical documents. Adobe Acrobat Reader is required to open PDF files. If needed, click the Get Acrobat Reader for the free download.